Looking to hire new help? Use our free employment application form template to help you find the right new hire. You can print as many copies as you need, or use it as a guide to create a more specific application form for your company. 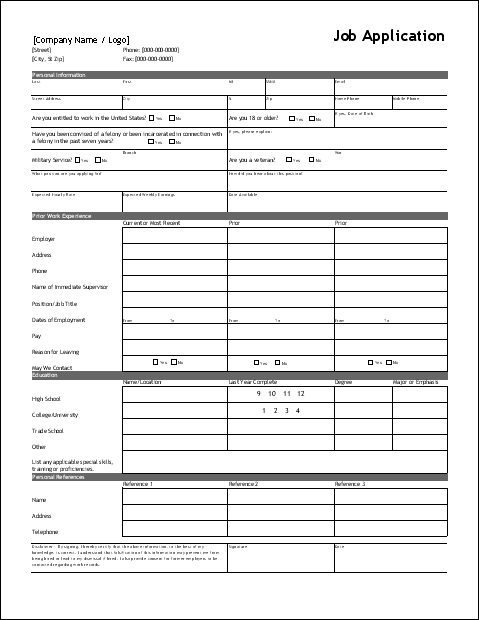 The basic job application form template will work for most job screening needs, and if you want to collect references, you can use the version that includes references. Vertex42 has many other templates related to employment and payroll. You may be interested in our letter templates, payroll register, and timesheets. After you hire your new job applicant, you can track their vacation and benefits using the vacation tracking template. 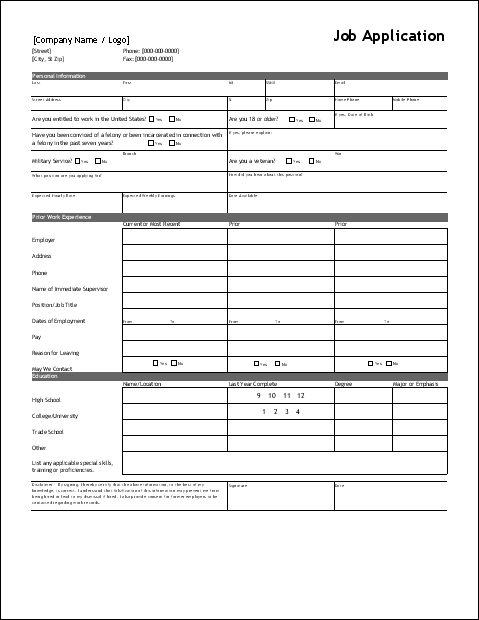 This free Job Application Form Template contains two different employment forms on separate worksheets - one with and one without a list of references. Use the information gathered on these forms to identify promising applicants, to ask additional questions and to follow-up with references and past employers. The version for Microsoft Word does not include references. If you want to include references, use the Excel version. For additional tips on the hiring process, see the tips and references below. Be Prepared – Make sure you are prepared to hire a new employee including job description, understanding of pay ranges and benefits and legal issues. Use References – If you collect references, then use them. 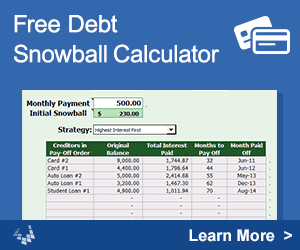 Make several quick phone calls can be very revealing. Ask Probing Questions – Make sure you ask detailed questions about education, prior work experience and skill sets to help verify the information. Cultural Fit – Work to ensure that the applicant will fit in with the culture of the company rather than be disruptive. Toe the line – Make sure you stay in compliance with federal and state regulations including E-Verify, new hire reporting and taxes. Face Time – For jobs that require more skills, consider having more than one person interview the applicant. Trial Periods – Don't be afraid to hire for a 30 day trial period. This trial time will give you the insight you need, but still allow you to part company if things aren’t working out. (Make sure you get the proper legal language in the employment contract). 10 Steps to Hiring Your First Employee at sba.gov - This article has some great tips on how to prepare and to hire your first employee. Make sure everything is in order. E-Verify Assistance at uscis.gov (U.S. Citizenship and Immigration Services) - This government site will guide you through the E-Verify process to confirm an job applicant's eligibility for employment in the U.S.